My client, Julie, is a manager at a large tech company. She opts for pieces that are on the professional side but expresses her style through unexpected prints and textures. Going through her closet was SO much fun. We found a wide array of pieces that could easily be updated with some key tweaks. You'll see lots of that in an upcoming booklet on tailoring. For now, let's dive into one of the high impact, minimal effort transformations from her closet. As Morrissey says, "Repurpose repackage reissue reevaluate." Who said the Smiths wouldn't stand the test of time? 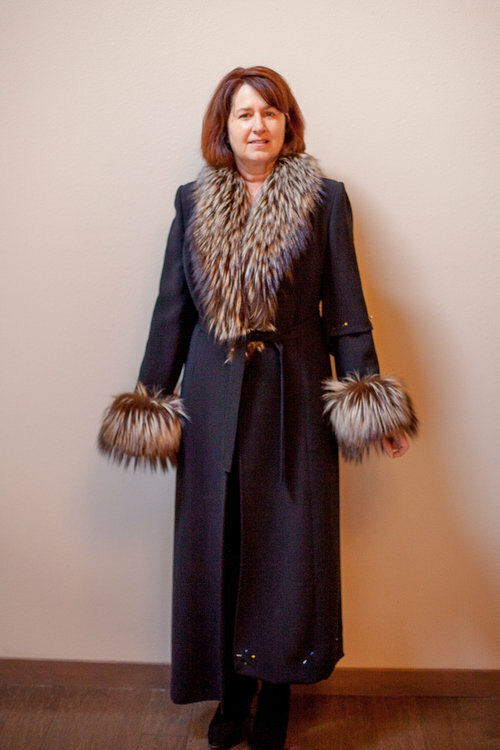 Julie's husband picked up this incredible coat for her when they were traveling in Paris years ago. She's always loved it, but over the years, it has started to feel, "a little Cruella Deville." So, it just hangs in the closet. When something has that much sentimental value, we know it isn't going to the donate pile. That's when you make the choice: is this going to be something to look at over the years or share with a future generation OR will it be something that can be enjoyed right now. You've likely heard me say this before, "everyday is a special occasion." What are you waiting for? Not everything should be reworked, obviously. So, be thoughtful before you start reeinventing. But, when you are ready, take the plunge. Here's the play by play of our coat adventure. For one woman, this is perfect. For another, not so much. Know your body and your personal style and the answer will be clear. Julie has an hourglass body type and has a modern, classic style with unexpected elements. Here style keywords are: Polished, Modest, Current but not Trendy. The first step to taking this down a notch was to remove the fur sleeves. I like to always preserve the original piece, if we can. So, we opted to have the cuffs be removable. Believe it! They can be reattached at any time thanks to the nearly invisible hook and eye closure. That way, when she isn't wearing the cuffs, no one will see a snap or buttons. A genius trick of the trade. Here's our incredible tailor working out the details. And now, to proportions. This coat is swallowing her up. Can it be a little shorter and have the belt hit her at her smallest point rather than over her stomach? It sure can. See! A tiny hook and eye. We opted to show it off with one sleeve on and one off, so you can get the full effect. Without the cuffs, she'll certainly wear this when they head to the symphony, as an example. Perhaps, years from now, she'll wish she had those cuffs. Back on they go. It's all about looking at your current pieces with fresh eyes. I can't wait to show you more tailoring fixes. Until then, what do think of this? Have any pieces you can try this with? Check out Poplin Style on Pinterest for more suggestions based on style key words, body type and more. Make sure you are signed up for the weekly newsletter. We're about to announce another giveaway and subscribers are entered into EVERY giveaway, EVERY time. Sign up!